The solid PVC gutter cover is excellent at shedding debris effectively. Made from rigid vinyl with a flex design that will fit most roof pitches. 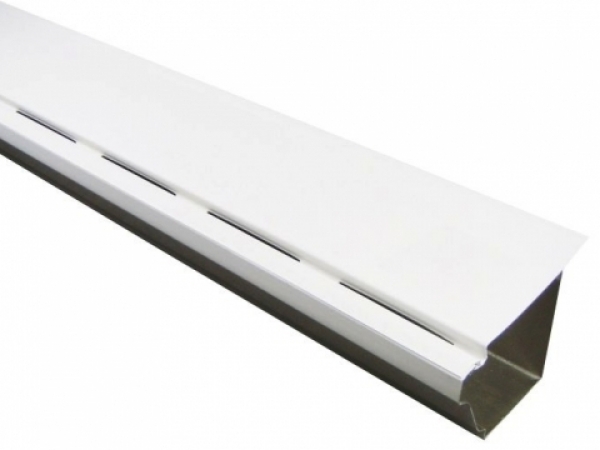 No fasteners or tools needed for this gutter cover; it fits directly into the gutter under the shingle and snaps on to the front end of the gutter for a seamless gutter look. Fits either 5 inch or 6 inch K style gutters. - Works on the principle of surface tension. 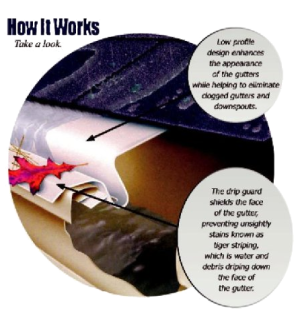 - Water flows around the nose of the Solid PVC Snap-In Gutter Cover and into the gutter through the slotted channel. - Will handle the heavies of rainfall. - Less debris accumulation. Leaves and debris are carried away by wind and rain. - Easy to install 4 foot sections fit standard 4” gutters, 5” gutters, and 6” gutters. - Solid PVC Snap-In Gutter Cover simply slides under the shingles and hooks to the front edge of the gutter. No special tools required. - Flex design accommodates many different pitched roofs. - Made of rigid PVC. 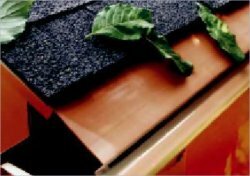 Solid PVC Snap-In Gutter Covers are installed on rain gutters to help prevent leaves, twigs and other debris from falling into the gutters and clogging both the gutters and downspouts. Solid PVC Snap-In Gutter Cover allows no obstructed gutters and downspouts will prevent rain water and melting snow from flowing through the gutter system. - Solid PVC Snap-In Gutter Cover is designed with two flexible beads that bend to fit up to a 14 – 12 pitch roof. Starting at one end of the gutter, slightly lift the shingles and slide the back edge of the gutter cover under the shingles, then pull the front edge over the lip of the gutter. The flexible back edge bends to match the pitch of the roof while the flexible front edge angles slightly forward to allow proper water flow. NOTE: Before installation of the Gutter Cover, bend the flexible front edge upward slightly at the score on the underside of the gutter cover. The gutter cover is the way to go when choosing this product. Make sure that the nose of the gutter cover is lower than the back edge. - For an outside or inside corner, miter cut opposite ends of two adjoining pieces to form a corner joint. NOTE: A splash guard may be required on outside corners, inside corners and where a downspout from an upper roof diverts water to the lower roof. Solid PVC Snap-In Gutter Cover is the way to go. You can also eliminate the heavy flow of water on the roof by connecting the upper roof downspout into the lower roof gutter. - Capping the Gutter Cover at the end of a run is recommended. This will help prevent birds from nesting in the gutters. A. With a pair of snips cut the inside width of the gutter to fit the gutter cover perfectly. C. Notch a “V” at the bend line. D. Bend the section down 90 degrees to form the end cap. Solid PVC Snap-In Gutter Cover is the way to go.